Preheat oven to 350 F. Lightly butter the bottom sides of a 10in round cake pan. 4 large eggs, at room temperature. 2/3 cup of granulated sugar. 1 cup unsalted butter at room temperature. 1. Combine the eggs, sugar, and the salt in a large bowl. Using electric beater or a whisk, beat on high speed until the mixture lightens and color and triples and volume. This should take about 2 to 4 minutes. Continue to beat at a medium speed for 1 minute, until the mixture forms nice ribbons. 2. In separate bowl, use a wooden spoon to stir together the room temp butter and coconut oil. 3. In another bowl, mix together the almond flour, baking powder, shredded coconut, rye flour & all purpose flour. 4. Gently fold 1/4 of the dry ingredients into the beaten egg mixture. Then fold about 1/4 of the butter mixture into the egg mixture and then fold in the remaining three quarters of the egg mixture. 5. Butter the bottom sides of a 10 inch round cake pan. Sprinkle the 1/3 cup of sugar evenly around the bottom of the pan. Arrange the rhubarb stalks across the pan on top of the sugars and pour tha batter over the top, smoothing the top with a spatula. Bake until the edges are golden brown and a cake tester comes out clean, about 30 minutes or so. These are so light, fluffy and easy to make. 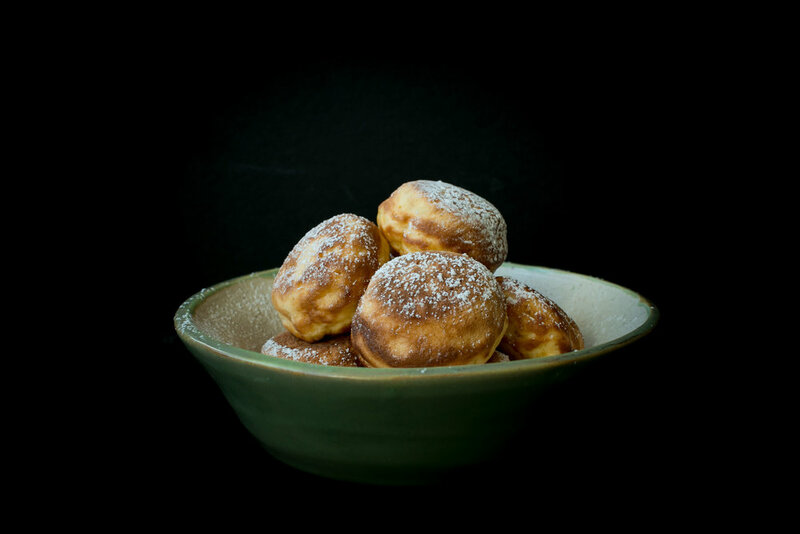 You will need to have a special ebelskiver pan to full these off though! You can find them easily on line. We used kefir in place of buttermilk which added a little tang to the batter. Whisk in egg yolks, kefir, milk, melted butter and vanilla extract. Whisk until smooth & thoroughly mixed - don't sweat the lumps. In a separate bowl, beat egg whites until they form stiff peaks. Top with additional batter - I fill ⅛" from the top. Cook until bottoms are golden and sides are set, about 3-4 minutes, then, using your method of choice, flip pancakes and continue to cook until bottom is golden - another 2-3 minutes. I used 2 wooden skewers to maneuver and flip each one. I usually let them cook until the tops have a ton of tiny bubbles and then carefully flip them. You'll find your groove. With a small pastry bag, pipe in the jam while still warm and dust with powdered sugar, or roll them in melted salted butter and drizzle with some maple sizzurp. Combine the cider, stock, kosher salt, brown sugar, peppercorns, allspice berries, and candied ginger in a large stockpot over medium-high heat. Stir occasionally to dissolve solids and bring to a boil. Then remove the brine from the heat, cool to room temperature, and refrigerate. Combine the brine, water and ice in the 5-gallon bucket. Place the thawed turkey (with innards removed) breast side down in brine. If necessary, weigh down the bird to ensure it is fully immersed, cover, and refrigerate or set in cool area for 8 to 16 hours, turning the bird once half way through brining if necessary. Preheat the oven to 475 degrees F. Remove the bird from brine and rinse inside and out with cold water. Discard the brine. Combine the apples, onion, cinnamon stick, and 1 cup of water in a microwave safe dish and microwave on high for 5 minutes. Add steeped aromatics to the turkey's cavity along with the rosemary and sage. Tuck the wings underneath the bird and coat the skin liberally with peanut oil. Roast the turkey on lowest level of the oven at 475 degrees F for 25-30 minutes. Insert a probe thermometer into thickest part of the breast and reduce the oven temperature to 325 degrees F. Set the thermometer alarm (if available) to 161 degrees F. A 14 to 16 pound bird should require a total of 2 to 2 1/2 hours of roasting. Let the turkey rest, loosely covered with foil for about 15 minutes before carving. I am fortunate enough to know a few hunters in the area. Believe it or not, most of them have no idea how to properly butcher! I usually get phone calls throughout the hunting season, to come and help teach hunters how to break down the different cuts and how to get a better yield. I enjoy it. I am always happy to share techniques and ideas. After all, someone took the time to teach me. I have a couple of close friends that are butchers. If you were to ask them what muscle is their favorite, it would most likely be the neck. It has a great ratio of meat to fat. It's also very versatile. I was gifted the whole neck (and then some) for helping out a friend of mine. Some of the first ingredients that come to mind when preparing wild game, are wild edibles. There is something so natural about cooking things that reside in the same habitat. We had some dried yellow foot chanterelles from last summer that seemed perfect for this recipe. I use the term "recipe" loosely in this particular story, as it is more of something that I threw together using what I had laying around. I hope to inspire someone out there to do the same. However, I will be sharing the cooking technique of how we pulled off this beautiful roulade! The stuffing was made out of sautéed onions, roasted garlic, thyme, rosemary, rehydrated yellow foot mushrooms, chestnuts & Madeira wine. We bought the chestnuts that were already peeled and ready to go (we usually roast our own, but we have three kids, give me a pass!). You can buy them at specialty stores or online. We seared the chestnuts in the pan in butter before we added the onions and it landed a deeper flavor to the stuffing. We then added the mushrooms and cooked for a minute or so to develop more flavor. Then we added roasted garlic and deglazed the pan with the Madeira and cooked it all the way down. After that, we added a bit of the water that we used to rehydrate the mushrooms and cooked that down as well. Then we added a knob of butter and the chopped fresh herbs. Easy as that. There was no bread in this particular "stuffing". Don't get me wrong, I am always pro-bread, we just didn't have any. It is stuffed into the neck, so it is technically "stuffing". We used a touch of transglutaminase on the edges of the meat to adhere both the roulade to itself, as well as the bacon to the exterior. Transglutaminase, also known as TG or "meat glue" keeps the roulade from coming apart once cooked. I have used this ingredient in many professional kitchens. TG is a naturally occurring enzyme in plants, animals, and bacteria. Enzymes are proteins that act as catalysts in chemical reactions; they speed up reactions and make reactions occur that otherwise wouldn’t. Confusing? Some people freak out when they here the words meat glue, because some chefs that have no idea about safety and sanitation use it to stick together scrap meats and form them into "steaks" which to me, is both appalling and uncalled for. When used properly, I see no issues with it. After all, if you love Turkey sandwiches, or cold cuts from the deli, you have been eating it your whole life. We got this product online. For more factual information on this product we provided a couple links at the bottom of the story from the International Culinary Center and the huffington post. Back to the recipe. Pack the stuffing into one edge of the butterflied meat and roll it over onto itself, nice and tight. Make sure that the dusted edges overlap each other. This is New Hampshire cob smoked bacon. It is a little too thick for what we needed so we stuck it in between two pieces of plastic wrap and flattened it with a meat hammer. We used bacon to this recipe, to add some well needed fat to the lean neck meat during the cooking process. It also adds a ton of delicious smokey flavor. Roll the bacon around the roulade and lightly dust the edges of the bacon with transglutaminase. Only dust the edges as seen above. The seems will most likely come apart if you skip this step. Once you follow the instructions above, lay down a couple layers of plastic wrap, side by side, until you have enough to generously wrap the roulade. Then roll the bacon wrapped neck in the plastic wrap as tight as you can. Leave a good amount of plastic wrap on both sides of the roulade. Pinch both sides of the plastic wrap and roll the hell out of it until it is tight. Using more plastic wrap (about a 8 inch piece), tie one edge of the roulade tight with a regular knot. Then repeat the process on the second side making sure that the roulade is tight on both sides. (this is to form the meat into a cylinder so that it cooks evenly) From here, we sniped off the excess plastic wrap (as pictured above) and cryovaced the roulade in a foodsaver bag and cooked sous vide at 138 degrees F, for 36 hours. Set it and forget it! This allows the meat to break down and tenderize, while keeping the meat pink and juicy, cooked medium. This is a picture of the finished product cooked all the way. This was sliced cold to show the stuffing. From here we cryovaced 4 each 6 oz portions individually. We sous vide the individual portions with a knob of butter and reheated to order in the circulator, then we glazed in veal stock & the remainder of the yellow foot chanterelle juice with just a touch of cider vinegar. Cook the liquid down before seasoning the glaze. Feel free to post your questions below. The finished product was glazed and juicy. The consistency and texture of the meat was tender and delicious. Although this is recipe is not for beginners, it is a stunning display of how to utilize the neck of any animal. We will be posting more simple recipes on neck muscles as well as other "off cuts". We just wanted to share this badass technique. We hope to inspire you! Cheers. Here are the links for further information on transglutaminase. Preheat oven to 325 degrees. Place 4 tablespoons butter in a 9-inch round cake pan or cast iron pan, and melt over low heat. Sprinkle brown sugar & evenly over butter and add the molasses.. 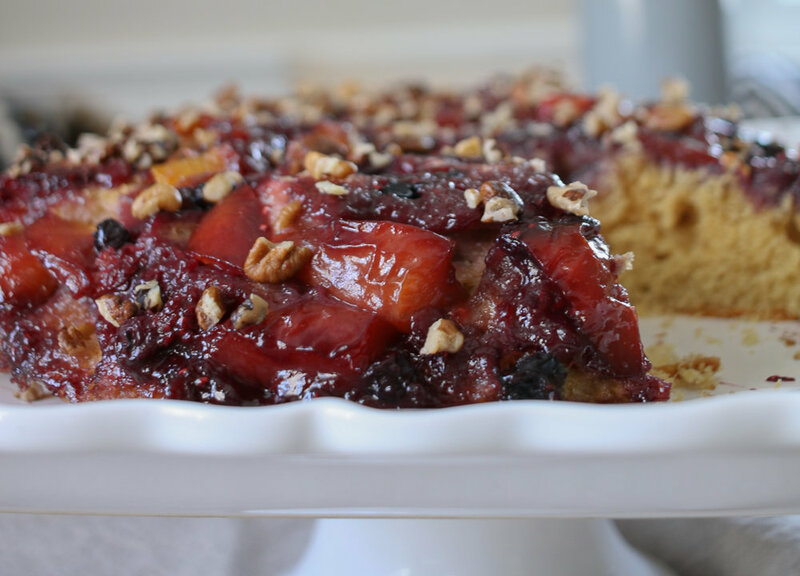 Arrange fruit in an even layer in pan. In a medium bowl, stir together flour, baking powder, baking soda, and salt. In a large bowl, using an electric mixer, beat 6 tablespoons butter on high until light and fluffy. Add granulated sugar and beat until well combined. Beat in eggs, one at a time, scraping down bowl as needed. Beat in vanilla. With mixer on low, add flour mixture in three additions, alternating with two additions yogurt, and beat to combine. 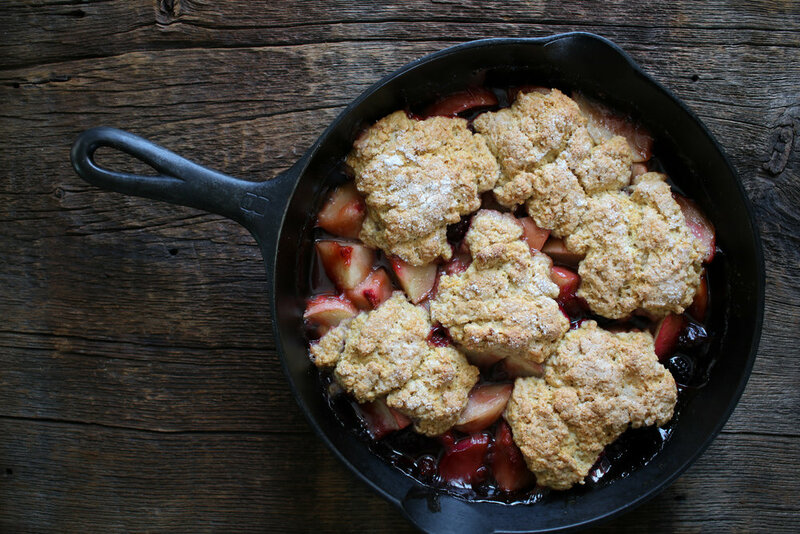 With a spatula, spread batter over nectarines. Bake until cake is dark golden brown and a toothpick inserted in center comes out clean, approx 45 minutes. Let cake cool in pan on a wire rack, 15 minutes. Run a knife around edge of pan and invert cake onto a serving plate. Garnish with the hickory nuts & serve warm. We also buried this beauty in piles of vanilla ice cream! In a large mixing bowl, whisk together the flour, sugar, and salt. Cube the butter and add it to the dry ingredients by rubbing it between your fingers until the dough resembles coarse sand. Add the lightly whisked egg and vanilla extract, folding the mixture until the dough comes together. Preheat oven to 350 degrees F. Line a 9-inch tart pan with parchment paper, or spray with non stick spray. On a lightly floured surface, roll out the dough into a 12-inch circle. Transfer into the tart pan, trim the edges, and poke the bottom of the pan with a fork several times to prevent the dough from rising while baking. Bake for 20-25 minutes at 350 degrees F, or until lightly browned. Remove from the oven and allow to cool. In a large mixing bowl, beat together the butter and sugar until light and fluffy. Beat in the eggs, vanilla extract, and salt. Stir in the hazelnut flour until uniform. Spread the filling evenly into the tart shell with an offset spatula. Place the pear halves in the filling and press down gently. Brush with the honey and bake for 40-50 minutes, or until the hazelnut filling is baked through and appears lightly browned. Cool to room temperature before slicing and serving. Here is a shot at the steaming set up. We lined a bamboo steamer with a clean towel and covered it over a water bath in a medium sized "rondo" or large, heavy bottomed sauté pan. I am a huge fan of miso. I am also a huge fan of Instagram. I find it to be a massive gateway to a whole universe of inspiration. I've connected with so many like minded individuals over the past couple of years and Rich Shih is one of them. After months of watching his waterfall of cooking and fermentation ideas on social media, he coincidentally reached out for a meet up. At that time, I was running a restaurant on a 200 acre farm in the Seacoast of NH and we were looking to learn as many preservation methods as possible in order to keep up with the harvest. It only made sense to have Rich come in and help us learn how to make koji, a key ingredient for a multitude of Japanese preservation techniques. We ended up using the koji he brought to make miso out of as many things as we could. We used chestnuts, black walnuts, peanut butter, smoked acorn squash seeds, crab apples & dehydrated milk for the protein, heirloom beans, you name it. We also made a "fish sauce" or "garum" by feeding equal parts koji to wild Maine mussels with 33% salt. After a few months, it was really frigging weird and mysteriously delicious. It smelled like grass & ocean air and it was packed with umami. After a year went by, Rich and I reconnected to taste some of the aged miso we made together. We also agreed to do a koji making session. The first key step to making koji is to properly steam the rice. When you cook the rice, you want to make it "al dente", for lack of a better term. This is to maintain the structural integrity of the rice so it will have space between the grains for the aspergillus oryzae to grow. It's the point when the rice is cooked enough to make the carbohydrates accessible to the mold for consumption and before the grains start to stick together. Rice fresh off of the steamer. Ready to slightly cool down and add the aspergillus orzae. Once the rice cooled down to about body temperature (must be less than 110 degrees F), we sprinkled on the aspergillus oryzae and tossed to combine with the rice. Rich had the idea of creating a stable environment between 80-95 degrees F using an immersion circulator. We rigged it up so that the water came only half way up the side of the 9x13 pan and covered the inoculated rice with a clean damp towel. The top of the circulator was covered with plastic wrap to keep the humidity in. The water was around 84.5 F and only had to be "topped off" once. This temperature gave us great results. The total time was 36 hours. Rice grains after 36 hours of inoculation. You could pick this whole thing up i one piece. It stuck together like a cake. A closeup of the spores blooming on top of a bed of jasmine rice! Rich is good people. He is dedicated to spreading that koji love wherever he goes. He was most recently in L.A at some of the top spots in town, sharing his techniques with all who would listen. If you would like to get the details on the interesting things he’s done with koji, check out this page on OurCookQuest.com. If you would like to see his current ideas, follow @ourcookquest on Instagram. We will be using ours to make all sorts of deliciousness from sake to soy sauce. I'm really looking forward to sharing the process! Stay tuned! Cast Iron Cornbread with heirloom flint corn. 1. Heat the oven to 400. Place a medium cast iron pan in oven while you get the mix together. 3. In another bowl, whisk the eggs, milk, buttermilk, melted butter & honey together. 4. Mix the ingredients by adding the dry to the wet and stir to combine. (please note, if you are using for stuffing, whisk it for about 30 seconds to create a little gluten structure. This will hold up better in the stuffing mix once dried and rehydrated. 5. Add the bacon fat or butter to the heated cast iron pan and pour the prepared batter in. 6. Cook for about 12-15 minutes or until a tooth pick comes out dry when inserted. 4 cups ½ inch diced stale sourdough. 2 cups dried/rehydrated foraged mushrooms (we used chestnut, but dried porcini, black trumpets or morels are great!) Soak dried mushrooms in room temp water until soft. Drain. Reserve the liquid for another use! 1. Melt the butter in skillet and add the onion and cook about 1 minutes or until translucent. 2. Add the celery & rehydrated mushrooms and cook for 2 minutes, then deglaze with the cider and cook all the way down. 3. Add the Turkey stock and bring to a boil. 4. Immediately add the dried & diced sourdough & corn bread and take off of the heat. 5. Add the herbs, salt & pepper and gently toss to combine. Let it rest and soak up for 5 minutes. 6. Check your seasoning and add the little touches that you prefer. Sous vide set up at 151 degrees F.
1. Debone the Turkey legs & thighs by carefully slicing down the bone line, tracing the leg & thigh bone. Be careful to not cut all the way through to the other side! You only want to slice through one side of the skin. Once you pull the bones out, double-check the flesh for any bone fragments, cartilage, or bloody spots and remove them. 2. Lay the deboned leg skin-side down on your work surface. On the side that was connected to the drum bone, you should see about a dozen tendons of varying sizes and hardnesses. Using a pair of needle-nose pliers and a small paring knife, start pulling the tendons out, with the back of your knife holding the flesh in place. Most of the tendons will slide right out no problem, but there are a couple that spread out into large flaps of silver skin. These tend to be a little more firmly connected. You may need to scrape at them with the edge of your knife to loosen them and pull them out. 3. Once all the tendons are removed, season the legs liberally with some kosher salt on both sides. This is important as it will “brine” the meat and keep it moist. Season meat with the chopped herbs. 4. Set your roll of plastic wrap on the top edge of your work surface. Arrange it so that if you lifted the loose edge of plastic wrap, the roll would roll toward you. This will help you keep the plastic tight while forming the roulade. Pull enough plastic over your work surface to cover it completely, plus a little extra over the edge. Be sure that it is completely tight, with no wrinkles, or it will make for a loose roulade. Place the caul fat down on the plastic like a large flat piece of paper, then place the first leg down on the caul fat, skin-side down. Place the second leg on top of it, skin-side up. Try to put the thickest parts of the legs on opposite sides, so you’ll end up with a nice, even roulade. Place the second piece of caul fat over the top of the leg and over lap the two ends of caul fat. Trim off any excess fat. Now, pull the loose edge of the plastic (the side closest to you) taut, and pull up and over the wrapped legs. While keeping the plastic taut, roll over four times. Grasp firmly on the edges of the roulade and pull the plastic outward. Poke a few holes through the plastic and into the center of the flesh. This helps any trapped air escape, making for a tighter roulade. Roll over a couple more times and repeat. Roll a couple more times and cut the plastic. Roll the ends of the roulade in opposite directions, so that the ends of the plastic compress the roulade into a tight cylinder. Tie the plastic off in a knot as close to the roulade as possible. Cut two lengths of twine just over a foot long and tie them on the ends of the roulade. Tie the knots so that you leave one short and one long end. Using the long side of the twine, twist around and down (toward the roulade). This will take up any slack in the plastic and make for an extremely tight roulade. Repeat on the other side. The roulade should feel very taut and spring back when you squeeze it. Place roulade in a ziplock-style bag and gently lower the bag, unsealed, into the water. The water will cause air to escape from the bag. Clip the bag to the side of the pot. Remove from the water bath and take out of the bag. Carefully pat it dry. Then brush with vegetable oil and re season with salt. To bake: crank your oven up to 475 °F and bake for about ten minutes or until golden brown on all sides. Deep-frying works great too. Heat a large pot of grapeseed or peanut oil to 400 °F / 204 °C, and fry the roulade until golden brown, about two minutes per side. Allow to rest up before slicing! Ahh, yes. Kimchi. I love the simple beauty of a few ingredients turned into something that is truly unique. I've overheard many arguments in the kitchen about what kimchi should be made of, what kind of ingredients to use, and even what kind of pot to ferment it in. I have respect for all of these arguments, because they are all right in their own way. If you look up the definition of Kimchi, it is "a vegetable pickle seasoned with garlic, red pepper and ginger." It is also the national dish of Korea. (Korean astronauts actually brought some with them to the international space station) I have heard from a few sources that when some people smile for the camera in Korea, they don't say "cheese" they actually say "kimchi!" I wanted to play around with a "non-traditional" version with a few different vegetables that we grew this year. I am personally a huge fan of the "original" fermented version made with the aromatic & unmistakeable dried gochugaru chile powder. I also love the depth of flavor you get by adding the traditional fermented fish of your choice. (fish sauce, dried shrimp, salted oysters, etc) so I added a touch of them to this version as a background flavor. I sourced some really special heirloom chiles this year from the farm. A couple of the varieties we used were: Reza Macedonian & Fish peppers. We dried some of them out to preserve them and save them for the winter. After drying them out, we lightly pounded them in a mortar & pestile to loosen the seeds and release the oils. We removed as many of the seeds as possible to lower the spice level a bit. (these suckers are HOT enough as it is!!) This is also important for when you grind them into chile powder. You can save the seeds for another use like sausages or infused oils, etc. QUICK TIP: If the dried peppers are slightly pliable, you can toast them in a 300 degree oven for 12-15 minutes, then let them rest at room temp for 15 minutes or until they are completely dry , before grinding. They will crisp up and be ready to go! 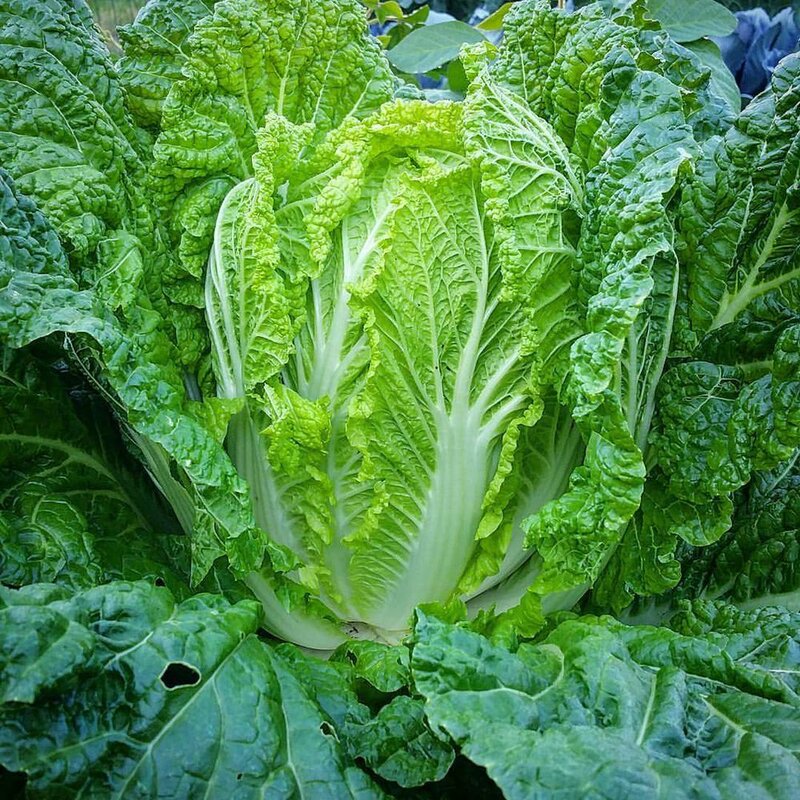 Here is a pic of one of our stunning heads of napa cabbage that we grew from seed this year. This is such a beautiful plant! After all the waiting for this to grow, it truly deserves to be fermented and preserved for months to come. We harvest these beauties throughout the season. I try to plant the seeds in stages so the we can always have some on hand. Out of all the things that we grow, Napa cabbage is definitely one of our staple/go to veggies. It's delicious raw, cooked, steamed, fermented, stuffed, you name it! Its always ready to back me up in a pinch. For this kimchi recipe, we like to cut the heads of cabbage into 2 inch by 2 inch pieces. Slice the cabbage lengthwise into thirds. Then, slice the opposite way into large 2" x 2" pieces. Try to shred the carrots the long way so that you can get the thickest and longest "strings" as possible. You want to avoid them from being small and mealy. These white carrots that we grew this year were so damn delicious! We had to put them in some sort of ferment, so that we can enjoy them later in the year. The next step is to shred the rest of your radishes and then add the grated ginger & garlic. The watermelon radish in this pic was born from a random seed that must have fell out of a package. It was sitting there all alone in the garden! We gave it a good home. Combine all of the ingredients together and check the salt/seasoning. Adjust to your liking, but be sure to pack it down into clean containers and add some of the brine (see recipe) if necessary, to make sure the kimchi is fully submerged in the brine. (we weighed ours down with a clean, large, smooth surfaced river rock.) You should let the kimchi ferment for a least 8 to 10 days before refrigerating. The picture below was fermented for 3 weeks. It is tangy, floral and spicy, with the perfect crunch! 2 Tbsp of dried chiles (ground into powder) We used two heirloom varieties called Rezah Macedonia & Fish Peppers. 1.Dissolve 1 cup salt in 1/2 gallon water. 2. In large bowl, combine the cabbage, shredded carrots, watermelon radish, leek, gochugaru, dried chili powder, 1 tablespoon of sea salt, fish sauce and sugar. Toss gently but thoroughly. (Gloves are recommended due to the spicy chiles!) Let the mix sit for about 10 minutes until it starts to break down in its own delicious juices. .
4. Let the kimchi sit for 4 to 5 days in a cool place before serving. You can refrigerate after you get some good fermentation on it to slow down the process. It will get stronger and more sour (better in our opinion) over time! Yuzu is one of my favorite citruses. If you are fortunate to come acrross them, snag a few for the hell of it and try this simple recipe for yuzukosho. This recipe is so simple and it can be used for such a wide variety of things like soups, sashimi, crudo's, rice dishes, cocktails, etc. It is great as a marinade and its awesome to say the least, when used as a cooking base. It is only three ingredients. Yuzu, salt & fresh chile's. You can use whatever chiles you would like. The ones mostly used are red Thai bird. I wass lucky enough to score a couple small & fiery lemon drop (aka aji limon) chiles from a local farm this year. These hot little suckers originally hail from Peru and pack a spicy, citrusy punch, which really works well in this recipe. This is totally worth trying with other citruses if you can't score any yuzu in your neck of the woods. Basically, the ratio is 2 to 1, citrus to chile, and 10% salt to the weight of the mix. We got about 6 yuzu and peeled the zest off with a vegetable peeler. The weight of the yuzu & peppers combined was about 3 oz so I added 0.3 oz of salt. This is not crutial. If you don't have a scale handy then just sprinkle that ish on and keep a close eye on it. Put the zest into a food processor, along with the salt & seeded chiles and let it rip. Blend all the ingredients together and add a little of the reserved yuzu juice to get it spinning. You can add a touch of water if you need as well. Just don't add too much. You can leave the mixture to ferment for at least a few weeks before using, It will develop further in flavor and complexity. Enjoy! 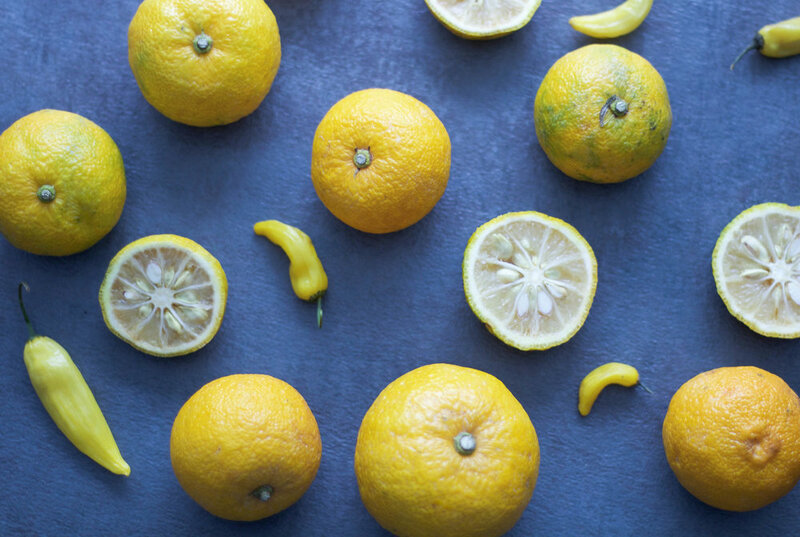 Recipe: 3oz yuzu peels, .3 oz salt, 1.5 oz chili peppers, 2 to 3 Tbsp yuzu juice. Thats it!